I have forwarded the mail 2 days ago but no rpy from your side. I am very happy. Today received the great sachin's signature back cover for srt phone. But not received 1 year extended warranty doc. Dear Please send extended warranty doc. Thanks! Request to share your contact no. I have an query about the same issue, I have already sent a mail on 24th of May, but till now I did not get any positive response from tCare. The screen shot is herewith attached. Got my Sachin back cover today (even though I dislike cricket & would have preferred if you gave a protective case instead). Thanks anyway guys. However with ref to the additional 1 year warranty no separate document received yet. 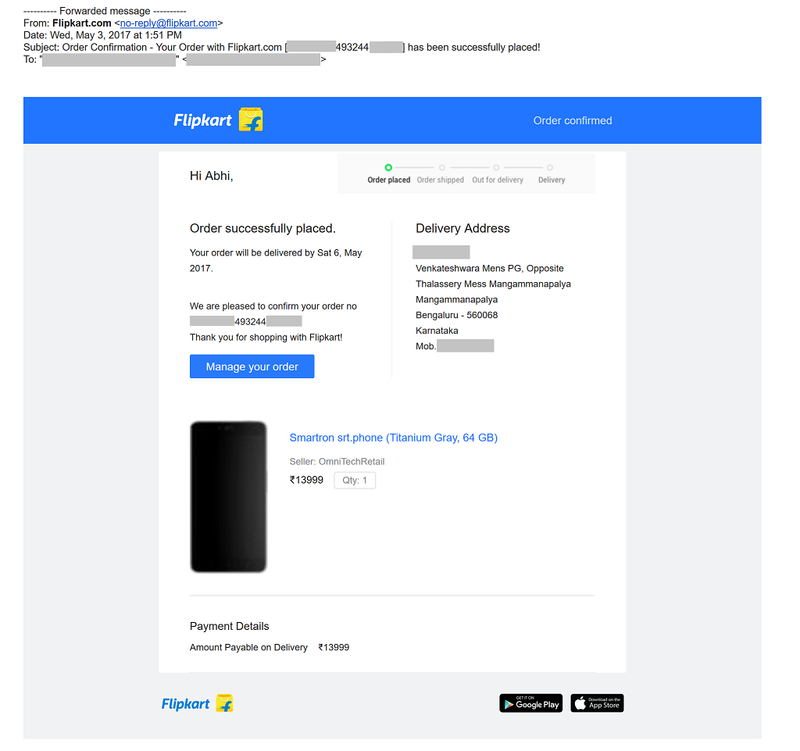 Will the Flipkart invoice specifying this offer suffice for any future requirement; or are you guys going to send a separate document for this? Your launch offer freebies are ready! Our team is all set to ship your free srtphone back covers within 3 working days. To initiate the shipping process, we request you to provide us with following details. Please forward your order confirmation e-mail which you received from Flipkart on your purchase of the srtphone to srt.offers@smartron.com. Ensure the order confirmation email is not edited. If you wish to change your delivery address from the one provided in the confirmation e-mail, please mention the new address in the body of the forwarded email. We look forward to hearing from you ASAP so we can begin shipping your back covers and extended warranty information! P.S: We have attached a sample confirmation e-mail for reference. Please ensure your confirmation e-mail looks similar to the one below. I have neither received back cover nor warranty card. I have send the details from same email. Just now received back cover.. thnx @smartron ... Those who haven't received yet, wait soon you'll get it. But extended warranty is not provided yet. Sir I have mailed 3 to 4 times but I couldn't get my freebies till now. @smartron I didn't get my freebies yet. I had replied to this mail on 24th May with a change in address, but had not received any confirmation on it regarding the shipment. Can you please update on the status. Sir I have forwarded the mail on 24 &25 may 17 but till now I could not receive the freebies or any message from you.so please kindly despatch my freebies I am awaiting eagerly. Please share the details on the same.